The element of surprise is the part i look forward to most when walking on our favourite beach. 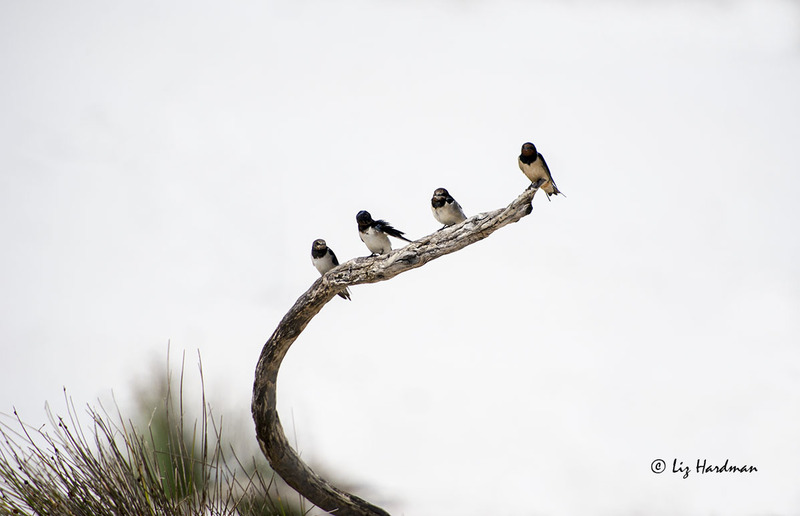 Yesterday I set off hoping to get some better photographs than the one below of some of the European swallows which like to inhabit an area near the coastal pathway. I admire these hardy little visitors who cover a long distance to spend summers on our shores. It was a heavenly day, but the wind picked up and the wise little birds were sheltering in a different area. 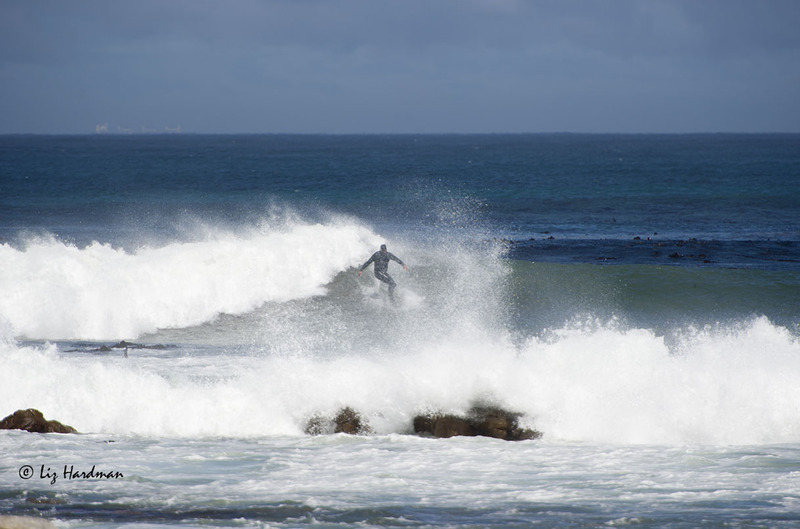 Meanwhile the surfers, fishermen, and kite boarders looked to be revelling in the freshning spindrift. 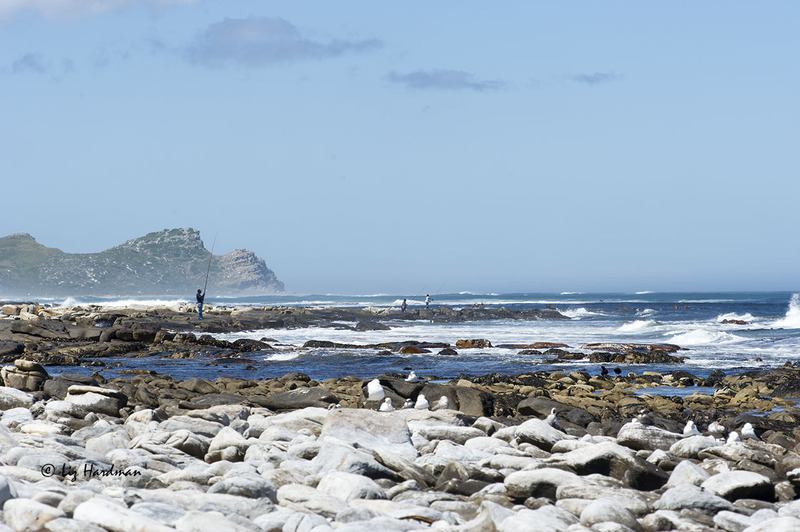 Surf angling is popular when the yellowtail run. The surf was up with a good curl. 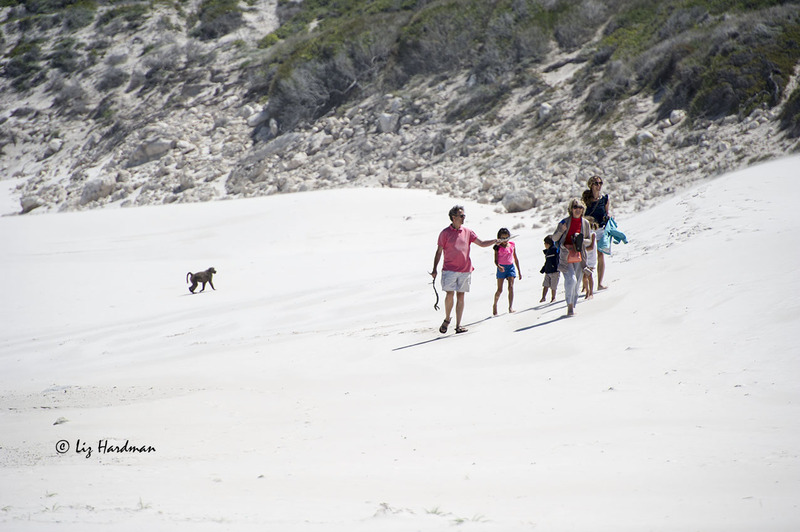 A lone baboon passes a family hiking in the dunes. While the baboon family are peacefully moving along a foraging route. Sliding, cartwheeling, with sheer exuberance. All in a tangle of limbs. Peeping from behind the reeds. The little sets the pace. No wait up a while. Stop for a nibble or two. Pa, the Alpha male comes padding by on a mission to get across the sand to the car park. The family follow, romping along. Meanwhile one of the sub-adult males is engaging in a reconnaisance of a different kind. He’s on the prowl for food. Checks out the door handles. Tries a variety of techniques to get in, pressing on the glass windows, levering the gap between glass and window frame with his teeth. Finally he finds an unlocked door and raids the car. Fortunately there’s no food, but he still searches the bags. As soon as the alpha male arrives, he beats it and leaves the scene. 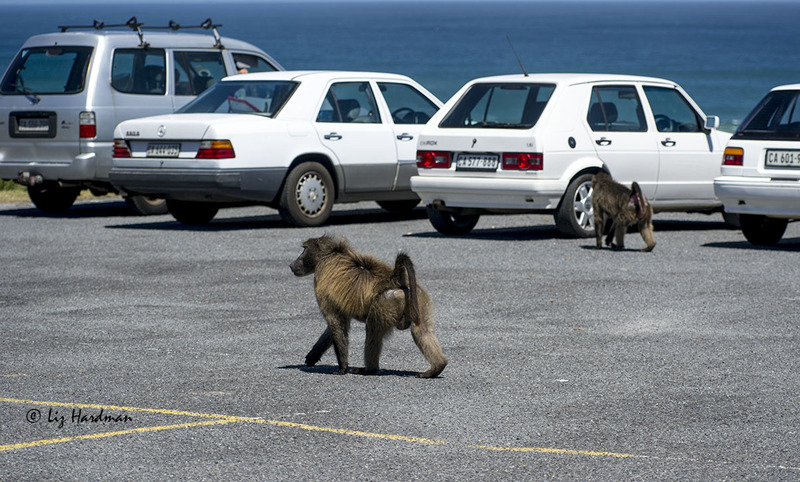 Savvy baboons: they have learned that where there are people and cars, there is a possible source of easy food. Leaving bags on car seats and in sight through the windows will certainly attract their attention. Lay out a picnic or light a barbeque in their domain and they will come to investigate and even make off with food that’s laid out for the taking. We could take better care not to tempt them with human food when we come into the areas which overlap with their homerange. Great gallery – they seem to have fun all the time. Thanks for the comments Leya. Just like humans… the juveniles and babies tustle and play, then when the hormones start kicking in, the story changes. We are much the same, yes. Oh my goodness! Here we have a problem with racoons and coyotes. And you definitely wouldn’t want either in close proximity. How wonderful to see them playing so relaxed! It’s a shame if they see people and cars as a larder, they are unlikely to find anything healthy and it will make them vulnerable. By the way – the two swallows on the left? they flew from Exeter 🙂 tell them its nearly time to come home. Aha, so that’s where they’re from! Seems like the word is already out – they’ve heard your call. They’ve started congregating, but are you sure that spring is really on it’s way ….?! Oh our baboons! They’re content in their own world and along come the humans and complicate their foraging options. 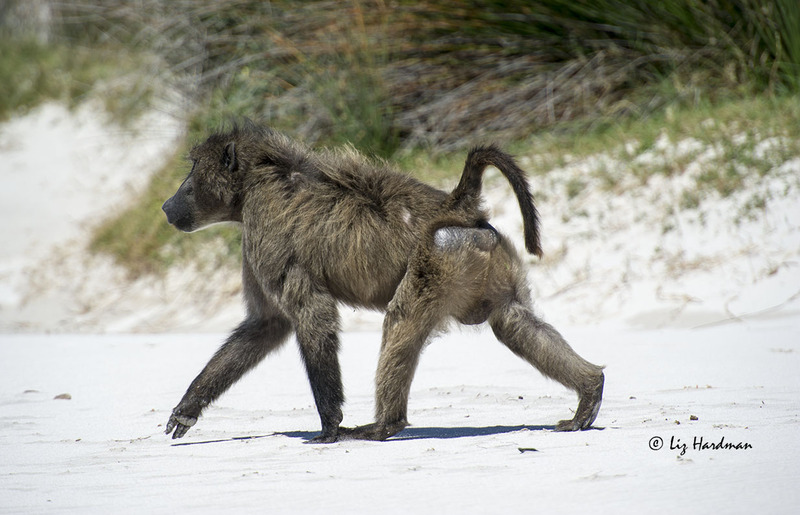 Fantastic post – from my point of view, where NEVER would I see a baboon at the beach!!! (My point of view being the northeast coast of the US.) I had to look up the location of Cape Peninsula to see where this occurred. These photos are so amazing to me! 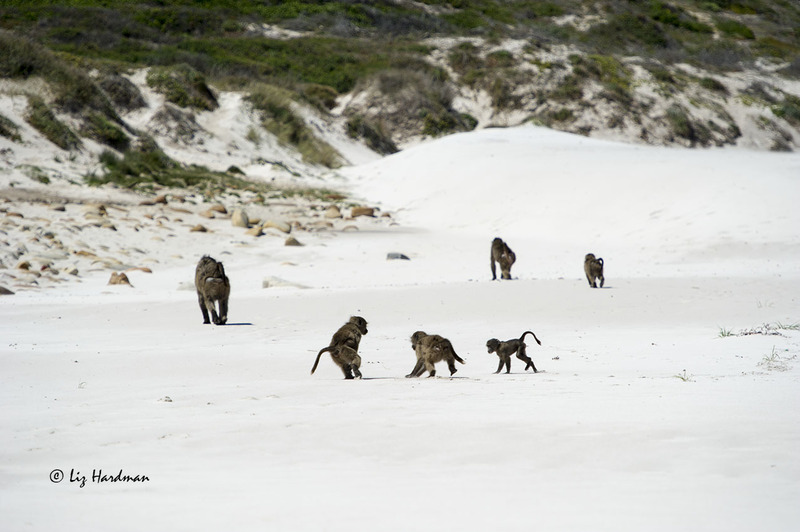 The beach looks so similar to my area of the planet, but baboons are thousands of miles away! Thanks, so much for the wonderful photography and storyline! Absolutely delightful! Thanks for your very encouraging comments Mary – makes this blogging scene all the more worthwhile 🙂 I shall mosey over to the northeast coast and have a look at your world…. thanks for visiting. How wonderful! I would be very nervous about those baboons! We had a similar experience in Tanzania where they invaded a tourist van and pulled apart their picnic and started throwing buns out of the window. It was funny (from a locked car) Are they likely to attack humans? Hi Sue Ann, I’m pretty wary of baboons in raiding mode! They tend to be very single-minded over getting what they want. Generally they don’t attack people, incidents tend to happen when neither baboon nor person will back off and the baboon might assert dominance rights over food. I find it interesting that they will exploit any given opportunity when it involves easy pickings. They’re fascinating creatures. They really are. Clever opportunists! How tempting, food, human things to explore, it must be terribly difficult for the baboons to stay away. Marvelous photos -as always. Yes, they’re very good at exploiting opportunities to explore the human food options. What an interesting and amazing photo/narrative. 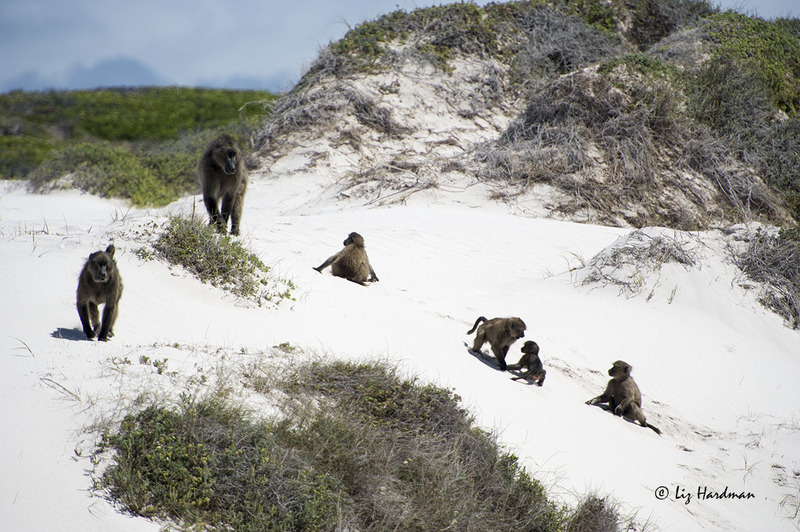 Baboons in the dunes… sounds like a story in the making, and with important lessons to be shared!